Oh, there has been much art, much business and a internet connection MIA. Damn technology! On the weekend, I worked on a short shoot of a showreel of a film written by local guys. Well, Jude and a friend of his. It was great to work on a professional shoot but stacked full of mates. It’s set in an office, but one where weird and strange things go on. We shot it in the office where my studio is housed, and it was fun running around dressing the set with subtle and not so subtle weirdness. No photos to show, the day was too jam packed with action, but I had a ball. It was one of the best organised and smoothest run film shoots I’ve ever worked on, plus like I said, about half of the actors and crew were people I knew, so it was a good day. But like every shoot, it went for 11 hours and I stood up the whole time, bar the half hour for (homecooked!) lunch. City Library invites you to ‘make your mark’ on our gallery wall. Draw, sketch, or write (poems, stories, observations on life etc) and hand your completed creation back to the Information desk to be ‘hung’ in the gallery. Please ask at the Information desk for A3 paper and art materials. I was really interested in that as an idea. I was right in the middle of reading Knit Art, by Ferne Geller Cone, a book from the 70s exhorting the joys of freeform knitting as artworks. I was fascinated by it, and itching to try it. So Blank Canvas came along jsut at the right time! I’ve recently come into quite a pile of wool and half finished projects, so I grabbed a bag of interestingly textured balls of wool and started knitting. This is the end product. It’s called Abstract Experiment, and it is exactly that. Fascinating process to go through, knitted all in garter stitch, utalising the short row technique. 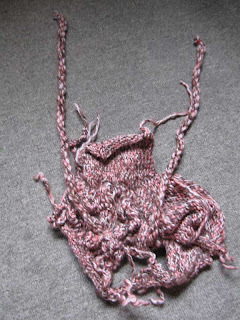 It also incorporates a number of small pre-knitted pieces I found in the bag. I am the first to acknowledge that it’s not the prettiest thing I’ve ever made, but it wasn’t created with an asthetic in mind. 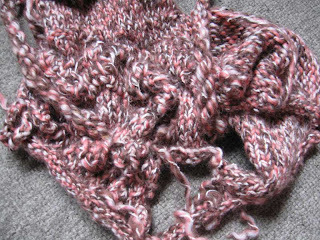 It was knitted to try a technique out. It’s not a tumor! I was really happy with it. The other piece I made for the show was something I’d been thinking about for a while, but like everything, I was waiting until the good idea had somewhere to go. I prefer to make things for a specific goal, rather than just randomly knit things. I love it 🙂 I like all the tails of the yarn just hanging, and it’s hung via the needles it was knitted on. This again is just garter stitch, this time utalising Instarta. I didn’t have time to steam it flat, but I figured it added a little to the ‘just finished’ asthetic it has going on. I love the happy expression on his face. But can I just say, OH MY GOD I HATE sewing slippery crushed panne velvet! Ohhh, it makes for much, much frustration. 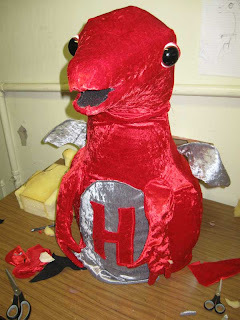 It wasn’t my idea, I’d much rather be using fake fur (which hides seams and little hiccups beautifully) or anything that isn’t slippery, but I’m matching a costume that’s already been made, so I have to go with their design choices. But again, I reiterate, BOO!!! 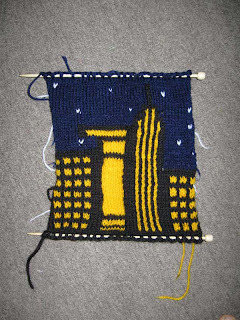 knittyscape is brilliant. you so make me laugh! Previous post: electrical faults aside, we got a family going on!